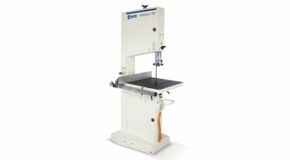 The band saw is probably the most important tool in a woodworking workshop, next to the circular saw, and is also very useful in creating craft objects. The band saw is often undervalued because its potential is not fully understood. A close examination of a band saw reveals that it consists of an upper and lower wheel. The diameter of the wheels determines the dimension of the saw section. A continuous blade travels from the upper wheel to the lower wheel and back. The direction of the teeth always points towards the table, rendering the band saw very safe to use. 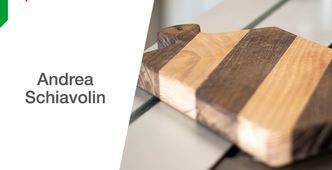 As opposed to the jigsaw, the band saw does not create vibrations during its operation, keeping the material close to the table. The blades vary in width, allowing for a great amount of flexibility: the narrower the blade the sharper the accurateness of the cut, whilst a wider blade can be used for crossways cuts. The saw has 2 blade guides, one above the table and one below, to keep the blade stable. A peculiar characteristic of the band saw consists in the possibility of changing the cutting depth, by changing the adjustment of the upper guide. 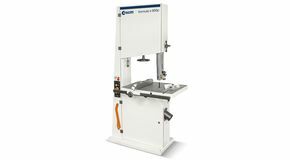 Changing the width of the blade lets you carry out various different machining operations with your band saw. A narrow blade lets you cut circle or any other circular shape. Moreover this type of machining operations are also very safe for small cuts, thanks to the absence of pull back. A wide blade with large teeth lets you cut piece of very thick material, such as the large arches used for shelves used in chimneys. 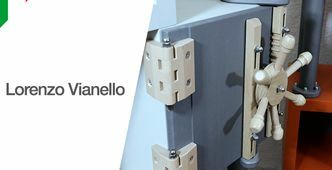 The band saw is a versatile tool that lets you carry out the most disparate operations; a truly indispensable tool for every woodworking workshop.